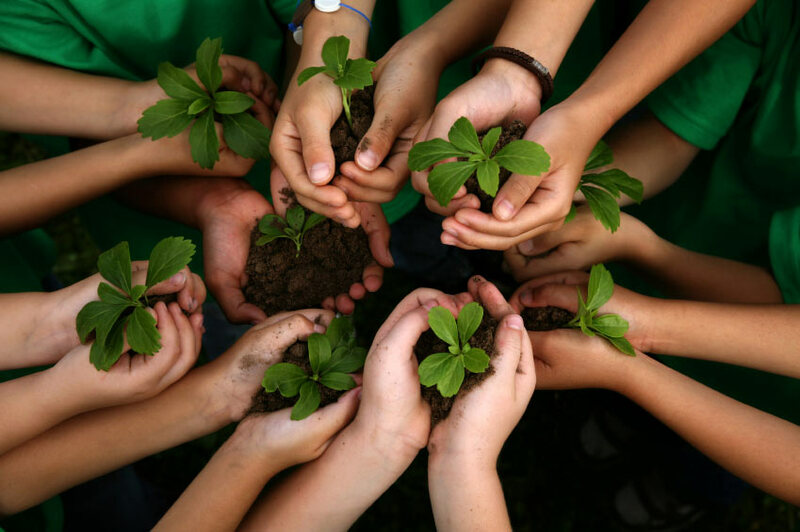 • Earth Force - environmental problem-solving program through which middle-school aged youth identify local environmental issues and create lasting solutions to these problems. • Student Conservation Association - engaging high school and college students in hands-on service to the land in national parks, national forests, and other public lands. • National Envirothon - High school competition offering both in-class curriculum and hands-on field experiences focused around ecology, natural resource management, and current environmental issues. • Journey for the Planet - A five week adventure to create an Earth-friendly life. • EPA Student Center - Another EPA site geared to middle school students. • EPA High School Environmental Center - Resources on environmental issues for high school students. • EcoKids - A place for Kids to find out about EE. IT also has a Kids Blog page but it is about what is happening in difference places rather than each kid write something. It also has a section for teachers/adults. Many different areas to use. • Kids Gardening - This site includes classroom projects, thematic explorations, parents' primer, classroom stories activities, kid gardening, FAQs, school greenhouse, guide, exploring hydroponics, pollinator curriculum, harvest of history and mountain adventures. • Classroom Earth - sponsored by the National Environmental Education and Training Foundation (NEETF) , lists top programs in categories of most popular, rising stars, home school, and for Earth Day. • Bullfrog Films - a leading US publisher of independently-produced, environmental videos. ​Five Minute Field Trips - excellent games for your classroom! Download link found in on our Resources Page! 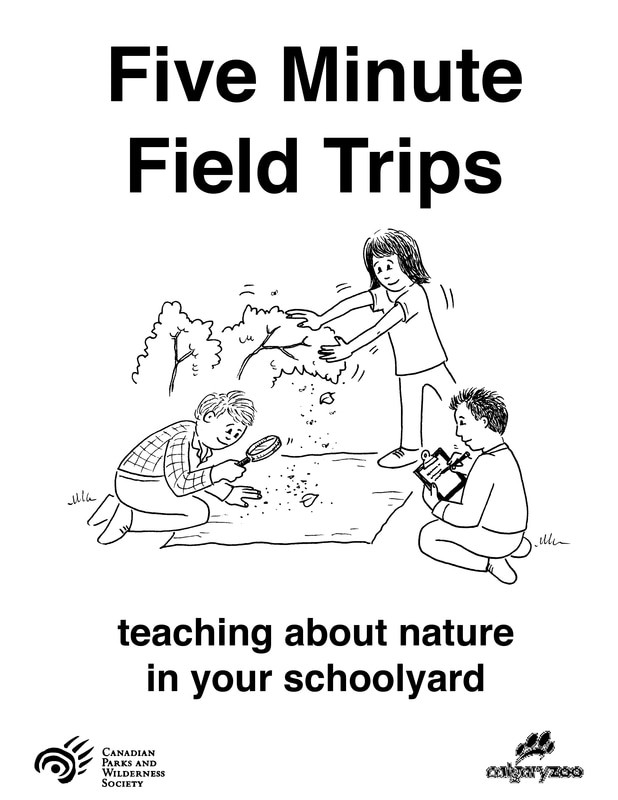 The activities in Five Minute Field Trips are grouped into three sections: Awareness, Understanding and Action. 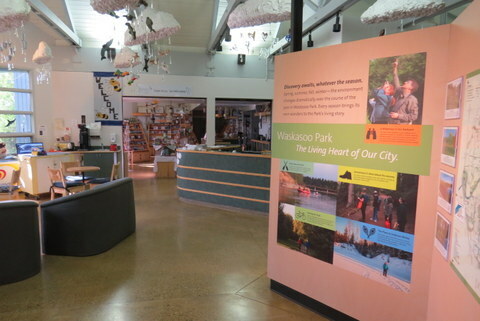 The Awareness section consists of outdoor activities that are sensory and experiential giving kids a chance to reconnect with the earth. Next the students will be involved in the Understanding activities which are exploratory and inquiry-based. For example, they will investigate a tree and all of its parts, examine and record insects that live in a shrub; or locate and make a temporary habitat for insects living near a pond. Most of the activities take place outdoors and are structured by categories of time, materials, instructions, discussion and variations. After completing the above mentioned activities students will be ready to engage in an action project. They will acquire citizenship skills guiding them to shaping a more ecologically sound, sustainable community. Students will be evaluated through two activities at the end of the unit as well as ongoing evaluation in the activities. A list of resources is provided at the end of the unit. The resources are Alberta based, however the field trips could take place in any province. • Working toward active, responsible global citizenship toward building a more peaceful, just and sustainable world. Global education is active and experiential in nature, engaging the learner where he or she is, helping the student to develop tools which will aid her or him in understanding where she/he is and why. These are the tools of critical thinking - the ability to question and analyze the implications of a particular reality. This is the development and practice of the skills of conflict resolution, reflective listening and dialogue and attitudes and values such as justice, compassion and peace which are characteristic of a global citizen (Choldin, 1993). Global and peace educators such as Betty Reardon, Toh Swee Hin and Virginia Cawagas (1987, 2000) have fleshed out a praxis which includes holism, dialogue and critical empowerment and added a dimension of hope and spirituality to teaching and learning within global and peace education. Toh and Cawagas (1987) employ the term "education for peace" to describe an education which "contributes to a better awareness of the root causes of conflicts, violence and peacelessness at the global, national, regional, community and interpersonal levels" and "cultivates values and attitudes which will encourage individual and social action for building more peaceful communities, societies and ultimately a more peaceful world." As with Selby, this framework includes the issues and spacial dimension ("these issues extend across global, national, regional, community and personal levels, and involve political, economic, social and cultural dimensions"). Toh and Cawagas (1987) emphasize the need to balance understanding and practice as well as reflection and action. An added dimension is the emphasis on encouraging the use of critical analysis to examine the root causes of conflict and peacelessness and the structural violence which arises from the systems of past and present. This critical understanding accompanied by action taking is the means through which transformation both personally and on a societal level is accomplished. • explore a range of different alternative futures, in particular ways of building a more just and sustainable world. Hicks sees the teacher as the facilitator who helps the student begin to build a clear image of peace and sees the place of peace education as curriculum wide, with process consistent with content. Hick's skills include critical thinking, co-operation, empathy, assertiveness and conflict resolution. Knowledge objectives encompass conflict, peace, war, nuclear issues, justice, power, gender, race, ecology and futures. Attitudes include self-respect, respect for others, ecological concern, open-mindedness, vision and commitment to justice. Personal transformation is the beginning point rather than the end result for Reardon (1988). She speaks of a peace paradigm to "fulfill the human potential for authentic excellence" with positive human potential reflecting positive peace and learning to change to transform ourselves. She, like Hicks, Selby, Toh and Cawagas, agree that a holistic, integrated approach is needed and fears that the traditional approach in education of carefully delineating goals and objectives which can be evaluated with quantitative measurement divides knowledge into isolated compartments which get in the way of true understanding of the world today. The teacher's role, like the students', is that of a learner and the practice, as with Toh and Cawagas, is compassionate, just and peaceful. With peace being defined as "a condition in which justice can be pursued without violence, individually and socially", Reardon (1988) integrates justice building over time and through issues "intentionally, day by day, habit by habit, norm by norm, structure by structure". Like Selby, Reardon emphasizes interconnections and interrelationships between planetary stewardship, global citizenship and humane relationship. Reardon's language is more spiritual in nature, with reference to "becoming" as the significant part of being and the inclusion of reflection, particularly the value of silence, reverence and reconciliation as fundamental capacities of peace education (the others being responsibility, risk, recovery and reconstruction). These capacities are developed through a learning cycle based upon active learning strategies such as capturing vision, formulating images, articulating preferences, constructing models, assessing possibilities, planning policies, taking action, reflecting on and evaluating change and confronting reality. Like Hicks, Reardon (1988) outlines a "blueprint for preferred futures" through envisioning, imagining and modeling. Throughout her model, there is a strong emphasis on the imaginative process and the element of risk in bringing to life that which can be imagined; "a significant element of human potential is the ability to direct the change in self and in society toward preferred values and to relate responsibility to changes in the natural order". • The GLOBE Program (NOAA) - a worldwide hands-on, primary and secondary school-based education and science program. • Wild Things - an interactive distance learning adventure including satellite broadcasts that help students and teachers explore and learn about National Wildlife Refuges and the fascinating critters that inhabit them. • What is your state doing in Environmental Education. • The National Council for Science and the Environment (NCSE) - Earth Portal is a comprehensive, free and dynamic resource for timely, objective, science-based information about the environment built by a global community of environmental experts: educators, physical, life and social scientists, scholars and professional who have joined together to communicate to the world. • Earth News - including breaking news with links from key word to encyclopedia articles for the science behind the news. Wetlands, perhaps nature's least appreciated landscapes, are vital to the health of ecosystems, maintenance of water quality, and moderation of climate change. Click the numbered bullets to explore the worlds largest wetland areas and understand the BENEFITS of protecting the world's waterlogged lands. Early this summer, environmental education was given a resounding endorsement with the release of a report titled Closing the Achievement Gap, prepared by a 12-state consortium known as the State Education and Environment Roundtable (SEER). After studying programs in 40 schools across the United States, researchers for the group concluded that students learn more effectively within an environment-based context than within a traditional educational framework. The study found that students in programs that used the environment as a context for learning performed better in mathematics, social studies, science and language arts than did their peers in traditional programs. • learner-centered and constructivist approaches. There were nearly equal numbers of elementary, middle and high schools in the study, and a balance of urban and rural and rich and poor schools. On average, the schools had been using environment-based programs for more than seven years. The authors of the report, Gerald Lieberman and Linda Hoody, visited all of the schools, interviewed hundreds of teachers and students, and administered a variety of surveys to teachers and administrators. In addition, 14 of the schools undertook quantitative assessments, comparing the grade point averages and test scores of students in EIC programs with those in traditional learning programs. The higher performance of EIC students on standardized tests was particularly remarkable because the programs in which they were enrolled used authentic learning and assessment methods that did not prepare students for standardized test formats. Equally striking, the higher performance of EIC students was evident at all grade levels. Besides scoring high on tests, students in these programs had fewer discipline problems, and at-risk students worked better and learned more effectively. A concern of some educators is that integrated learning programs may not adequately cover subject content. Yet the study found that students in these programs actually had a more thorough understanding of the content than their peers in traditional programs. The EIC students tended to read more, often beyond the requirements of their assignments. They retained more of what they learned and produced greater volumes of higher quality writing. They had more opportunities to apply mathematics and science in real-world contexts and better understood the concepts of these subjects. Finally, the EIC students developed a greater understanding of social, economic and political systems. A large majority of teachers reported that, in addition to mastering subject content, EIC program students developed better interpersonal and citizenship skills. Students found themselves in more situations requiring decision-making, which in turn helped them develop self-discipline, mutual respect and a sense of community. A sense of camaraderie and collaboration led students to act with more civility towards each other. Finally, students in these environment-based programs had few doubts that their studies were meaningful. The study’s findings are also encouraging for teachers. Most teachers in EIC programs felt rejuvenated and reported greater enthusiasm for teaching in general and their own subjects specifically. They enjoyed better interaction with students, learned new teaching methods and discovered new opportunities for professional growth. Unlike most environmental education research to date, which typically assesses the effectiveness of EE in developing skills, knowledge and behavior related to the environment, this is the first study to confirm that using the environment as a context for learning enhances the efficacy of education in many subject areas. The authors acknowledge that evidence from 40 schools cannot be considered conclusive and say they are planning a more comprehensive and quantitative follow-up. But as the first study of its kind, Closing the Achievement Gap documents what many environmental educators already know from experience: that using the environment as the context for integrated learning offers the possibility of closing the nagging gap between education’s potential and its less promising reality. This is a document that could persuade even the most reluctant administrators that environmental education is indispensable. • What is your state doing about EE and who to contact check out: Environmental Education. • Environmental Literacy Council - The Environmental Literacy Council is an independent, non-profit organization, the Council gives teachers the tools to help students develop environmental literacy: a fundamental understanding of the systems of the world, both living and non-living, along with the analytical skills needed to weigh scientific evidence and policy choices. • The Environmental Education and Training Partnership - (EETAP) - federally funded environmental education training organization - includes an environmental literacy quiz and an university-level online course in EE. • SeaWeb - a multi-media project designed to raise awareness of the world ocean and the life within it. • Global Response - Global partnerships for citizen action. Outdoor education can be simply defined as experiential learning in, for, or about the outdoors. The term ‘outdoor education’, however, is used broadly to refer to a range of organized activities that take place in a variety of ways in predominantly outdoor environments. Common definitions of outdoor education are difficult to achieve because interpretations vary according to culture, philosophy, and local conditions. 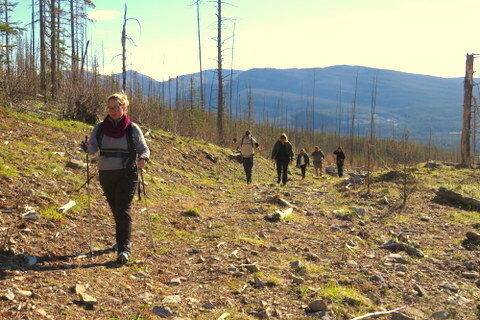 Outdoor education is often referred to as synonymous with adventure education, adventure programming, and outdoor learning, outdoor school, adventure therapy, adventure recreation, adventure tourism, expeditionary learning, challenge education, experiential education, environmental education, forest schools and wilderness education. Consensus about the meaning of these terms is also difficult to achieve. However, outdoor education often uses or draws upon these related elements and/or informs these areas. The hallmark of outdoor education is its focus on the "outdoor" side of this education; whereas adventure education would focus on the adventure side and environmental education would focus on environmental. Wilderness education involves expeditions into wilderness "where man is but a visitor." Definition taken from Wikipedia - https://en.wikipedia.org/wiki/Outdoor_education.